samples from guest designers, get ready to blog hop! Who's Who "Where are They Now?" guest spots! Prizes!!! Stamps, Paper, Copics, oh MY! come as you are, see you in a couple hours! (unlike the last couple eyars, I WILL be waiting up LOL!! (I thnk this is officially my last post of 2008!! the 474th, good grief!! who will be the last person of 2008 to comment??) For those of you who are out partying, have fun tonight, be safe!!! 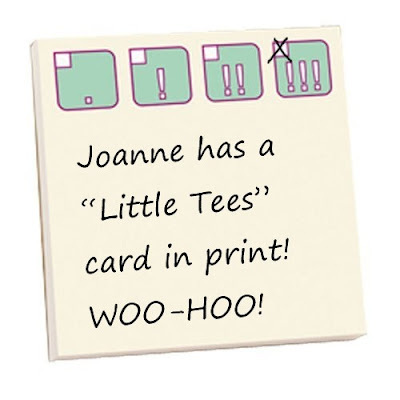 I was SO excited to read Joanne has a card featuring my "Little Tees" set in "Cards" magazine this month, you can find this wonderful publication anywhere! (I expect a major spike in the sales of this already popular set now, hee hee! ;) get it while you can LOL!! Thanks, Joanne! You rock! I'll be off to Hobby Lobby today as soon as it opens, but I am 99% sure I know which card they chose, hee hee!! It was "divalicious" if I'm right!!) I have several of my own cards coming out with my different sets after the first of the year, too, can't wait for you to see!! I'll have another post later today with a little more about what to expect this week for the blogaversary!!!! can't wait!! With these bright red nails, these hands could work for two friends or for husband/wife or boyfriend/girlfriend. I wanted it to be fun and cheerful to be able to send it to a BFF near or far away that I want to be there for or brighten her day but just can't get close enough to reach her! For the nails, I added a dab of red Copic to the end of each finger and traced around it with a fine line black ink pen. TIP: Try adding glitter or go over with Copic Spica or Stickles for sparkle or a drop of Sakura Glaze to each nail to look like real polish! (I could have picked a "trendier" color like blue or violet, but you know how I love my red!) Hands are colored with E00 and E21, both from Box A. This fun paper is from the Basic Grey Cupcake pack. Polka dotted ribbon is from the Gina K Pure Luxury Holiday collection. Image and sentiment are stamped on Gina K 80 lb white and die cut using the Classic Oval and Petite Oval ( these petite longer ovals I just got are great for sentiments!) Card base is Real Red. Less than 2 days to the blogaversary celebration!! Are you excited to see what all the prizes are?!! What sets are you most excited to see used here? Back later, thanks for stopping in!! Check this out!! In just ONE foot of desk space (I placed my ruler on top to show! It's 7 " deep and 9 1/4"high) I have all* my Gina K bagged stamp sets from ALL our illustrators (not her sets hat come in tins) from the past YEAR in these binders(I linked the 6 pack for savings, but they can be purchased indivuidually), neat, safe and easy to find! (Before I had this stack of shees with myall my rubber on, getting dirty and it's a miracle I hadn't lost any iamges that way!) I was able to make a page from one 8 1/2 x 11 printer paper for all 9 binders (with some room left over for a few January sets soon to come! ), trimming each spine to one inch wide. As a little "gift" to you, I am oing to be providing the document if you want to use it for your collection, it looks so nice and neat to have them all printed out, you can modify them as you wish to include to different sets! So check back for it, just got to figure out how to attach it! The Blogaversary Blowout Bash starts 12:00 AM January 1st! You will not believe all the goodies, Stamps, paper, Scor-pal products and, are you ready for this, COPICS!!!! Be sure to subscribe so you don't miss out on the fun!! Something's fishy, this card looks much better in real life LOL! For Isabelle's tail I used about 10 different Copics in various shades of pale greens top blues and even some purples, just dabbing here and there to fill out the scales and sin and it really gives it an iridescent look. Then I went over all the lines with my green Copic atyou Spica for shimmer. I used both the Spots and Dots and D-vine Swirls folder to look like bubbles and waves and accented some of the bubbles with the self-adhesive rhinestones, I love that these come in several different sizes on one sheet, doesn't that look like real bubbles rising to the surface? I went through my stash of stamps and turned up no fish sentiments, and then realized happily, I had something very appropriate for this pear shaped lady after all: "hippy birthday!" LOL!! I framed it up on a round tag to go with the bubble theme, the scalloped long Nestie frame goes nicely with the fish scales...The tail I added separately and curved out and under with my fingers, really looks like it's undulating, this is definitely my fave outfit from this new set, I heart mermaids! My blogaversary is just a few days away, eeek!!! It's going to run all week and HUNDREDS of dollars of prizes from me and my fabulous sponsors will be given away, also new samples from all my sets this past year, and guest star appearances from past contest winners and guest designers, can't wait!! Be sure to subscribe to my blog if you haven't already so you don't miss a single day or chance to win! ...to let someone know you're thinking about them during this busy season with a card. I found as I got closer to Christmas there were a lot more people I wanted to send cards too, but I didn't have much time left to get cards made, let alone elaborate ones. I also spoke to friends who said with great regret that hadn't had time to make cards to send in time for Christmas this year, but I love receiving cards post-Christmas and I think the idea of just" Holiday" or cards "blessings in the year new year" are just as nice to get! Here are some super simple ones I created with "Seasonal Greetings" (which take you past Christmas, I love that!) and "Have a Cookie". Begin with a 120 lb Gina K Pure Luxury white base, you can use your Copics on this single layer and with a paper like this, your simplest designs will still feel rich and elegant! 'Happy Holidays" is stamped in Real Red and the images are in Memento Black. To add a little depth and create the illusion of a plate to ground my cookies, I embossed a nestabilities circle around the images. I took my red Copic Spica and traced and added a few sparkly details to my little gingergirl. The red 1/4" grosgrain adds some spice as well. I took my Inkssentials white opqaue pen to fill in the sprinkles on the tree, it really makes them pop! TIP: Color the whole cookie and then add sprinkles and color them, much easier than trying to color around each tiny bit! Hope you enjoyed this card, sometimes simple is best! THUD!! Are you as impressed and inspired as I am?! "I love the child and adult hand image and knew that it would perfect for a Santa and child setting. So I dug out my wonderful BasicGrey papers and went to work. I first stamped my hand images on to a die cut oval. I used some soft water color pencil crayons and gave the hands some soft skin. I drew the cuff on the Santa suit and extended the child's hand using my thin sharpie acid-free pen. I masked off the hands using some Post-it-Notes and stamped on a number of pine bough images from the "Winter Foliage" set to set the mood of the back ground. I then used some Liquid Applique and gave the cuff a soft, fuzzy texture. I added a tiny string of ahesive pearls to the child's wrist." A coat of Crystal Lacquer brings the cookie jar image to life, "Baked with love" is just one of the many sentiments you can add to customize the crockery! A Sakura Glaze Pen adds shine and dimension to the smaller images like the measuring spoons and cutter. Everything is colored with copics, and are popped up on dimensionals. Polka dot background is SU! DP. If I don't "see" you tomorrow, I hope you have a very Merry Christmas! This festive wreath is made from Gina K's "Funky Christmas", very simple to make, look! Remove your circle and go back in stamping a snowflake between each pair on the outside row to make a smaller ring inside. If you have some bare spots, just fill in stamping more if necessary until your wreath is nice and fluffy. I tied a little bow with my 1/4" grosgrain, leaving the tails long and twisted and adhered the ends in the places I wantted with glue dots. Then I added Christmas Red Stickles in little clusters of three, with both big and small dots in each group, all over the wreath. That beautiful shimmery red paper you see below is Incandescent Rosso again, from Paper Temptress. Last I stamped "joy" in the center from "Seasonal Sayings" and traced that with Stickles as well. I nothced out the corners of my Gina K 80lb white paper with the corner ticket punch and added some SU! artichoke brads before attaching it to the Incandescent Russo paper and then the Artichoke base. TIP: I love putting round images or focal points onto square card bases, the proprtions are so beautiful. You could adapt this design to an ornament by stamping it onto a painted wood circle, wouldn't that be sweet? Have a beautiful day! I really wish I had posted this project a couple weeks ago for your inspiration, but I only just got around to making it! :( I remembered a concept that was introduced to me by my stepmother several years ago, she gave me a tree ornament that opened up and was meant to hold a little gift from your beloved. So how about a tin? (we give a lot of gift cards in this house LOL!) This is a great way not only to decorate your tree but have a beautiful reusable gift box year after year that the recipient will look forward to opening each Christmas morning, it will become a tradition! Creating the label and tin was simple: First I stamped my border in Old Olive from "What's in Your Tin? 1" on Gina K Pure Luxury 80 lb white CS to make a top label for my tin. Then I stamped it on some scratch paper and cut out the inside of the bottom to create a mask. I stamped my poinsettia from "A Year of Flowers" in Always Artichoke over the mask and removed, now it's perfectly contained inside my custom border! I opened the lid of my Altoid tin and punched two holes in the top with my Cropodile. Then I tied some 1/4" grosgrain to hang it and some 5/8" grosgrain around that (shown in next pic) to jazz it up. These ornaments remind me of the classic "How the Grinch Stole Christmas", so I had to make some "Who" decorations! After stamping my ornaments, I sketched a droopy line to hang them all up, going through each hook and off the borders of my mat on to my card base. I traced everything with my silver and purple Copic atyou Spicas for shimmer and added some self adhesive rhinestones to the corner. "joy" is from "Seasonal Sayings"
A few more posts and I will be DONE with Christmas cards for another year!! Have a very festive day! I should probably tell you a little about the town I live in before I show you today's card, lest you think I either went crazy or was coloring in the dark! 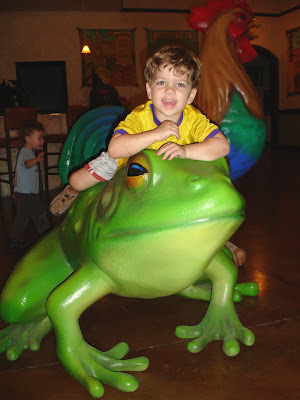 Austin is a very artsy community where individuality is celebrated,where people prefer funky, family owned businesses to chains, and where, after living here for 17 years, I don't even blink when I see a car covered with hundreds of plastic dinosaurs going down the road! (I just smile and think, "There it is again!) These are just a few of the reasons why Austin's slogan is "Keep Austin Weird". In keeping with what every 10th or so house in my neighborhood looks like(but not ours), I just had to make a card with "Home Tweet Home" to let anyone moving in around here what they are really in for!! This was so much fun to color!! All Copics, my favorite picket being, you guessed it, the "cow" print! I just happened to have some DCWV All Dressed Up DP that went smashingly with it, and then I needed to grab some orange for my base and turquoise for my tag to really finish it off! With a card like this, you really have to "go BIG or go home", so to speak, or people might not really "get it", LOL! First: Guess what?? My "official" blogaversary is coming up, but the date I really want to celebrate is just after the first of the year, which will mark the anniversary of when I really got my blog off the ground with my first set of stamps from Gina K Designs one year ago! To celebrate I will be having new samples from all my previously released sets from past guest designers and contest winners, and of course lots of free goodies and giveaways, sponsored by some of your favorite companies: Scor-Pal, My Favorite Things, Paper Temptress, and of course, Gina K Designs! So be sure to subscribe to my blog if you haven't already, the celebration is going to last for DAYS and you won't want to miss a single one!! Hands were colored with my Copics from Box A, and outlined with C-3 (from the same box). I made a few little vertical lines down with my daker shade around the wrist like the stretchy cuff of a mitten The black sleeve I meant to look like my black turtle neck with a fitted sleeve. Then I stamped my front arm onto the back of a piece of Magnolia DP, and then cut out leaving room all the way around it to make my larger, baggier "jacket"sleeve. When I flipped it over, I ran my black marker along the edge to give it a "drawn" look and adhered it over the front arm. (I moved the sleeve away so you could see, but I outlined the paper piecing and hands with a c-3 marker after placing it on top) I also outlined the bottom and right side of the DP sleeve with my c-3 to give it a shadowed look to math my hands and give it more dimension. "Sending you Christmas CHEER!" This was a fun card to make, I always love creating scenes and going to look at Christmas decorations around the neighborhood is always a favorite holiday activity of mine, some people really go all out here! I stamped a row of 4 snowpeople to represent the four people in our family (giving them each a different colored hat) to send to our cousins. The images are colored very simply with Copics with a little Pale Aqua for shadowing on the left. Then I stamped out the long "Merry Christmas" from "Seasonal Sayings" in Real Red and cut between the letters to make several little signs they can could hold up and dangle like a fun yard-art display! Running a black marker around the edge of each square makes them look like they were drawn that way. Then I placed them all askew, some attached with glue dots, some popped up on dimensionals, a few placed as though two were holding one sign together, a couple as though they are hanging by a thread (which I drew with my pen) and one that looks like a sign stuck in the snow. I drew that too, adding a little curve at the bottom of the post to look like a little hole in the snow. "from all of us" is handwritten at the bottom. This is sort of a hybrid of my actual writing, I tried to keep it fun and funky looking, to match the art work. If you have more than three snow people you'll have to make it a long card to fit. If you look carefully, all the snow bottoms are touching exactly, no spaces or overlap! I point this out, because I didn't use a stamp positioner, just my fabulous round acrylic block, it is just amazing how straight and precisely I'm stamping with these, you've got to get them! Here is a card I created, just a few days after I received my new "Hand-in-Hand" set, for a friend, the mother of my son's best friend at school: her stepfather passed away after heart surgery last week. I wanted to make something simple to convey we were there for her family, and hoped to offer some "light in the dark". I began with a white card base and sponged the bottom the card with Basic Gray ink, concentrating at the bottom and working upward to have it fade to white, and did the same on my focal point mat. The white border was made by holding my Nestabilities die in place while sponging and them removing. hands are colored with Copics. I'm sharing this now becuase I was very sorry to read two sad stories today on the net: one that a fellow blogger Joanne Johnson, whom I did not know, had passed away suddenly, (although I don't know the cause, she had last posted just the day before(not ill at the time!) Her husband was kind enough to share the news the very next day on her blog, knowing that so many of her readers would be missing her stories and creations. The second I saw on Cammie's blog, about a blog candy offering by Andrea, who is asking for RAKS for a family whose new baby is very ill. Please check out these two links if you have time and can send up prayers or send out cards. I will be making two more cards similar to the one above today to send out to these families, and God willing the baby will pull through!! Life is so short, never take this blessing of TODAY for granted! I pieced the baby's arm with the flower print by drawing a line just under the wrist and cutting and attaching, then wanted to bring more of these yummy Basic Grey Two Scoops prints into my card to make a blanket background. This card uses 4 different papers from the pack. You can create this same design with squares if you don't have the Labels One dies, but if you do, why wouldn't you? ?I just love these dies! Start by cutting out a label in the same size from two different prints. I made a couple snips from the scrap left over to either side following the curve and punched the bottom of it with Threading Water to make a nice border for the inside (see the last photo). For the inside I stamped a sentiment from Rectangle Greetings over the same hands image I had stamped in Versamark. The layering of these looks so soft and sweet, and this sentiment goes so well with the image, too! The hands are colored outlined with Copics and the little heart from "Just So Hippy" is stamped on both hands in Real Red. "Sweethearts" is stamped onto SU! Silver Brushed CS and cut out with one of the Tag Trio Nestabilities Dies. I used these adhesive metal dots I found at Hobby Lobby and stuck them on at the wrist and around the sides of the mat to line up with the little tag holes like an ID bracelet. Something cool about these little dots, they are adhered to the sheet in strips, so I was able to pull off a whole row and attach them rather than pulling them off one by one, AND they look like they're in a strand, just like a bracelet! (The self adhesive rhinestones are like this, too) I put dimensionals under the tag and placed it askew to look like it's just draped there. I hope you will find "Hand in Hand" to be one of the most versatile and unique sets in your collection. Below is a compilation of my tips for it so far, but I'm sure it will grow. As always, I'll be sharing projects illustrating these tips right here on my blog! Links have been provided throughout for projects you can see right now with these stamps. All greetings can, of course, be mixed and matched with the different images, but they have been placed next to, above, or below a greeting that works perfectly with it and is already centered, so you may want to make one cut in between the greeting and the image and then put them back together on your block when you’re ready to use them both. Experiment with a variety of flesh tone pencils, markers of watercolors to make your hands match exactly match the two people you wish to represent, see Emily's sample. They look terrific stamped in a monochromatic color scheme. Imagine pink or blue for a new baby card or announcement! Emboss images and greetings with EP for easy elegance! Simply stamp in black on white for a dramatic card. Piece on colored/patterned or textured gloves or mittens by stamping on DP and drawing a line across the wrist or arm at the desired length, and then cut and adhere to your stamped image. Think pajamas for the baby(see peek above, full sample coming up! ), an elegant dress sleeve and suit for the wedding couple (Kurtis ), etc! Makes fantastic masculine cards in earthy tones. The baby hand holding the finger makes not only adorable announcements, showers, welcome baby and baptism cards, but is gorgeous for Christmas as well! The two images with the hands held down by their sides, can be turned upside down to look like a pair holding their hands up in victory when Pair this with the "Congrats!" greeting! (Very celebratory!) Or pair with the "hope is faith" quote and they look like praying hands, see Asela's sample. The paired images that are reaching out to each other can be stamped horizontally, or tipped to the left or right, whichever works best for your particular layout, or tilted to convey that you are helping someone UP (or thanking them for helping YOU)! Stamping greetings on vellum and laying it over the hand images give your card a beautiful, dreamy quality, see Carolyn's sample. All images and greetings are fabulous framed up in the various Nestabilities shapes! Place your shaped die around the image and then trace with a pen to give the line drawing a custom looking frame! Choose one that fits exactly, or is just a bit bigger and then extend the lines of the wrists to the edge with your pen. Sponge around the edges of your mats to give the special hand-holding moment a “glow”, see Theresa's sample. Have fun with your embellishments by creating bracelets or rings with stick-on rhinestones or halfback pearls for the wrists and fingers! Adhere fibers around the wrists to make little “friendship” bracelets. Try adding a bit of colored "polish" to the fingertips for nails! Make a slit on either side of the wrist and pull a little chain with a charm through, this is a beautiful way to present a real bracelet or necklace to someone. Make a “progressive” card or page showing three of the hand vignettes to represent your growing child and relationship with him or her paired with photos, using the words in the stamps to label “Baby”, Child”, “Friend” . This design would make a great waterfall card! “My Valentine” can be trimmed so that you can use the word “my” separately to make “My Friend”, "My Child", “My baby”, etc. When cutting in between words, I always bend my stamp back on either side so the place I'm snipping is pushing toward me and the words are pulling away from each other, this prevents cutting into one of your letters by mistake! The hands with the “Hope is faith holding out its hand in the darkness” is perfect for get well, sympathy, or any “cause” cards you need to create. Great for caregivers, organizations that need donations, etc. See my blog http://melaniemuenchinger.blogspot.com/ and the rest of our talented team for more inspiration and samples illustrating each of these tips AND please share your great ideas too, I’d love to see and hear! Isn't this a happy card? I started stamping Gina K's flowers in Ruby Red and Old Olive and then chose a paper from Basic Grey Cupcake to match, I loved these thin earthy stripes and pulled out that pumpkin color from the print with these SU! buttons. It was just looking so fresh and cheerful I decided to draw on two little smiles under the "eyeholes" before attaching them with glue dots, hee! I see Joanne doing a ribbon treatment like this a lot off the side of the card with the ends tied off with hemp or thread instead of knotting the ribbon, and I love how perfect it looks here with those beautiful stamped leaves. I adhered my mat at an angle to give it more energy and stamped "friends" from "Say it with Flowers" to go with this this sweet little pair. (The "Tropical Flowers" set has no greetings in it, "Say it with Flowers" is a perfect set to complement it with it's all occasion greetings and floral quotes!) All done, yeah!! I love how fast this one came together. Are you as busy as I am right now?? Eek!!! Have a great day! My tip sheet comes out tomorrow along with a little card peek, you're gonna love it! Had to share some pics of taking the kids to meet Santa today at the Blue Genie Art Bazaar. More about that later, it's a fun funky"Austin" thing. 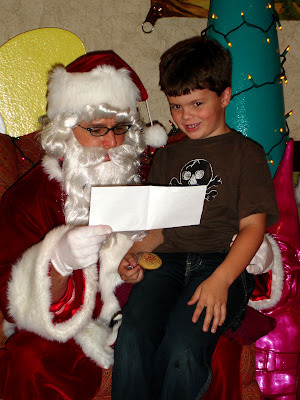 Despite that my kid are 6 and 3, I think this was on of the only times they ever met Santa, we have one pic of Jonathan when he was two and he got so scared he never wanted to do it again. Same for William every season we see them at the mall, they get these eyes and run the other way! Maybe the welcoming "weirdness" of this place made them feel at home! I wanted to share a great way to make these new butterflies of Gina's without any coloring. Try embossing onto an iridescent, shimmer or "incandescent" CS like this one, which I got from Paper Temptress. I have it in several colors, but of course the Russo (red) is my favorite. I tipped the paper in this pic so you can see it has this amazing gold cast to it! oooh, ahhhh!! I embossed the butterfly with my Ranger SuperFine Embossing Powder, the coverage was great, I highly recommend this EP! * Now if you look closely, you'll notice this CS has some texture so it may miss a few tiny parts of your image. What's also cool about this paper, each side has a different texture, one is more "lined", the other more of a cross hatch grid, so choose the side that best fits the look or theme of your card. **I am definitely going to use her sketches to get going with my "Hand-in-Hand" set for pages, her layouts are so professional-looking and she puts a lot of work into this "fool-proof" (IMHO) designs I should have no problem coming up with something I'll love, even though I don't consider myself a scrapper! Embossed in gold, I thought this tiny baby's hand holding the finger from "Hand-in Hand"would be a wonderful way to represent God the Father and God the Son for a card representing the true miracle of Christmas. To make the card I used Gina K Pure Luxury 80 and 120 lb CS and SU! Gold Glory EP, Brushed Gold CS and brads. Isn't that gold trimmed ribbon perfect with this embossed line art? It's also Gina K, from the Pure Luxury Holiday Ribbon assortment. ...Sharri Seffens was my random drawing winner!! hip hip hurray!! Don't buy the set tonight, Sharri, it's on me!! Send me you snail mail addy, the "Hand in Hand" stamps and card will be on it's merry way to you! Didn't win (this time?) Please keep playing AND there are 6 more chances to win tonight(my set or any other you choose from Gina K Designs!! 3 (EASY!) contest questions and 3 card challenges, all of which are randomly drawn and could mean free stamps for you!! You have until next Monday to complete, and don't worry: buy what you want tonight, if you win, Gina will refund your money for the set! See you in a few at the party, I gotta go do my hair!! Since you've already seen some peeks of "Tropical Flowers", and they go so beautifully with this set "Take Flight" from Gina K, the Free with Three Set this month (they just keep getting better and better every month, don't they?!) , I thought I'd go ahead and use them today on the same sample. Is this new butterfly gorgeous, or what? I used several shades of light and dark blue and aquas on the wings to give them the iridescent quality of the Morpho butterfly, one of the most brilliant blues found in nature! Then I decided to go ahead and pull out my Brilliant Blue CS( which I don't think I've ever used on my blog!!) and found that putting it with the Bashful Blue mat and Ballet Blue tag, the different shades tone down the base and these different shades of blue really work like the different scales of a butterfly's wings, I like it! The sparkle you see is from tracing the lines with my Blue Copic atyou Spica pen. Bending the wings out from the body and then ends back down a bit before popping it up on a dimensional will make it look like a real one just lit on your card! I love how the curves of the Labels One Nestie mats echo the butterfly shape. 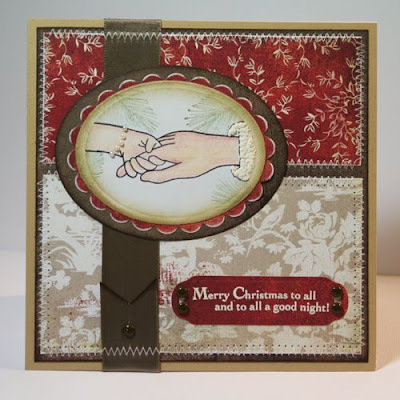 I continued this theme by choosing an oval shape for my greeting and using my corner rounder punch on the base. The flower silhouette is done by coloring my Ballet Blue, Brilliant Blue and Old Olive and Always Artichoke markers directly to the stamp, stamping, and then stamping off to create the lighter bloom on the left. "Dream" was inked up separately from the "Let your (dream)s take flight" quote in the "Take Flight" set, and framed up with SU! Silver Hodge Podge. and Carolina Buchting, our In the Spotlight Designer this month! A few months ago, I was going through my drawings trying to decide which of my planned sets would be most appropriate for my December release, and Gina reminded me to start thinking about Valentine's Day on the way. Now at the time, my mother was doing hospice care for my grandfather, so my mind was very focused on family and relationships. Over and over I kept coming back to connecting with someone by holding hands, and started sketching pair after pair of clasped hands. When I finished, I felt I had something very special and unlike any set I had or had seen before. Gina agreed it would make perfect Valentines , but when we reveal all the images and greetings included, you'll see it's much more than that. In this month's set "Hand in Hand", you will find vignettes celebrating two people bonded in this simple, intimate touch, in every stage of life: happy ones like birth, friendship, love, marriage, and hard ones when someone is sick or needing help and support. Although the "woman" is not wearing a glove in the image, it is fun and easy to add one to make it look like a formal wedding by piecing a silky glove from white shimmery CS as I did above. Just draw a line across the arm at the desired length, cut out (fingers, too!) and attach to your first stamped image with a Quickie Glue Pen for those small parts, doesn't that look real? The image is colored with Copics (Skin White, Baby Skin Pink, c-3, Black, all from Box A) I went over the underside of the shimmery CS as well with my gray marker to give it a shadow. The little cuff link dot is filled in with my Stardust glitter pen. I blinged up my black fancy corners to match with self adhesive rhinestones. Now that little winged heart is made from the other half of the Fancy Corner Punch, I told you I had something special planned for it! :) Punch out two of the thicker corners from the punch in Real Red and White CS. Now snip off each top of the corner with a rounded cut on each side and down into av to connect and make the heart. On the white one, snip down between the "wings" a little deeper so you won't have the "little diamond" sticking up above your heart. layer the red and the white, and add a little shadow with a gray marker under the wing if I desired. On my card, I punched out one more in black and layered it behind the two just to make it a little more dimensional and show up against my Black Market Ebony and Alabaster DP. Last you can see the inside of my card which I dressed up with more of the DP under my white layer that I punched with Threading Water. I made this card with my husband in mind, but you could change the greetings out to make an anniversary card or wedding day card (where it can say "the journey begins...") with this image as well. Would you like to win this set? Please create a card, page or 3-D project inspired by a favorite "hand in hand" memory of yours (it does not have to use hands, can have any stamped images, photos, found objects you choose, go nuts!) and upload the pic to Papercraft Planet with the tag GKDMMSJ, I will pick one winner randomly and announce it tomorrow night at 6:30 PM before our release party tomorrow night (7-10PM CST) in the SCS Gina K forum! I will ALSO pick a favorite project and that person will receive be a guest designer for me NEXt month and receive my January set(which you will LOVE!) Good luck, I want everyone to play and I hope you join us for more peeks at the party!! Are You Here Looking for My Preview? Ready to get your Weekend Bake on?? 12 Days: Day 7 "Black and White Elegance"